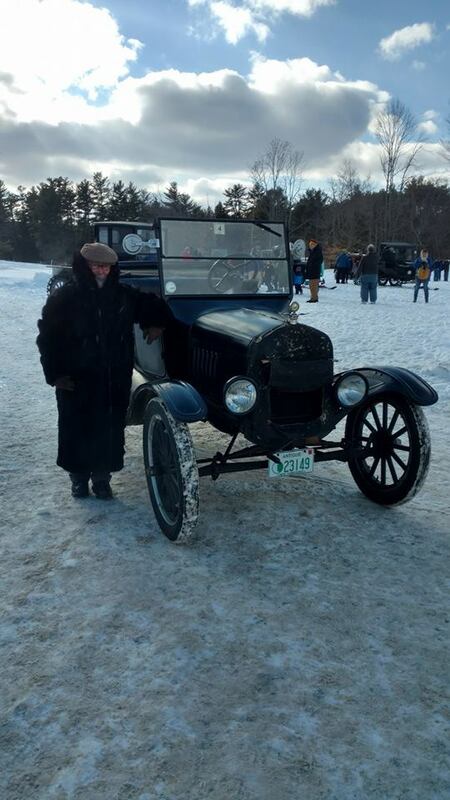 I've often wondered about how to transport my Model T the sixty or so miles from my home to some of the cool shows on the eastern end of Long Island. Buying a trailer and a heavy, tow-capable car or pickup truck for the purpose of making this run three or four times a year is impractical, so I'm wondering about a more cost-effective method. Does anybody know whether U-haul or some other outfit can rent out a trailer and tow-vehicle suitable for this kind of day-trip? U-haul does both, but you might prefer their 12 foot trailer instead of their auto-hauler. Your car will fit on the 12 foot. U-Haul 6' x 12' Utility Trailer with Ramp, 24 hours, $34.95 here in New Orleans. Just a thought here. I have an F-350 and a 30' enclosed trailer. I only use it for events that are more than a two-hours' drive away. Less than that, and we just jump in the T and go. Granted the Long Island traffic is brutal on the west end. I have found that the additional time it takes to hook up, load, secure, drive, and unload actually take considerably longer than driving the T there at 38 mph. I drive big cranes on the road every day for work. I don't get anywhere any faster in those things than I would in the T. An hour's drive in a modern car takes an hour and a half in either the cranes or my T. We normally put 150 miles on the T on any given Saturday just going out to breakfast, estate sales and whatever. Just a side note: You should bring your T to the Mystic Seaport event next September. Quick follow-up question, on the 6x12 U-Haul utility trailer, how do you guys secure your T in there? Are there U-hooks to tie down to? Thanks for the great tip, may do this on my next T purchase instead of the vehicle hauler. I have done 225 miles in the dead of winter. Stop by a Uhaul spot just for the fun of it. Yes there are U hooks in the bed. That is how I know. Hats off to anyone who drives his T very far to an event. Especially in winter. Our T mostly putts around the neighborhood. It only goes to one or two meets per year, 55 miles each way, and that's on a trailer. The only route to our destination is on U.S. Highway 101, 70 MPH speed limit, including a 7% grade for several miles. There are no alternate routes worth considering. Once on the 7% grade, you either finish it or go over the side. The only slow lane is the one trucks use at about 45 MPH. I can make the uphill run at 45 towing the trailer. The downhill drive is a white knuckle ride every time I do it. If you do rent a trailer, it's a good idea to have your own straps. I found the U-Haul wheel straps inadequate for Model T wheels. They didn't want to stay on. If you were going to Brooklyn or Queens, maybe renting a trailer would be the thing to do, but I expect the traffic wouldn't be so daunting in the other direction. I knew some folks would tell me to just drive the darned car the darned 120 miles. -Problem is, it's not just 120 miles if you use snaky back-roads�and of course, highways are in no way an option. 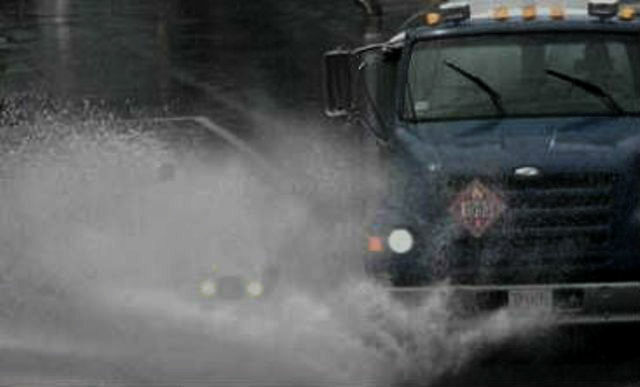 -Add an unexpected rain (which has happened to me), and brother, it makes heavy traffic, hills, impatient drivers and big passing trucks on flooded roads downright unpleasant�and dangerous�and that goes double after nightfall. Yeah, that'll take a good deal of enjoyment out of a car show. Oh, when I was young and full of vinegar (and hadn't had three spine surgeries, two knee replacements, hernia, etc. ), I'd chop an airplane out of an iceberg to fly it in weather that would freeze solid the breath on my mustache, but the days of such keen vigor are about a generation behind me. -Now, I need to do it the easy way and listen to suggestions along that line of thinking. Before I bought my own two-axle trailer I rented a U-Haul carrier like others have mentioned. No issues what-so-ever. And yes bring your own straps. One issue is that almost all U-haul dealers are franchises; some are great, some are awful. I have heard stories where a dealer would not rent a car-hauling trailer to a customer unless he/she rented a U-haul truck to pull it - I expect that this would not be an issue with a 6 X 12 foot trailer. I have a similar problem as Bob - the roads here in SW Florida are flat and straight and mostly posted at 45 or 50 MPH. That means that traffic flows at 55 or 60 MPH. That is too fast for the T. I do have a magnetic flashing bright red light on the rear, but I drive only at times of very light traffic. I know a fellow who rents a small Uhaul box truck, has his own home made ramps, and drives his 1910 right up into the truck when he needs to go more than 100 miles. He has NEVER told Uhaul why he is renting the truck. He has done so for over 30 years. I do not know if this is legal or not..
On one hand, I admire the pluck and determination of Model T drivers who aren't afraid of a little distance, aren't afraid of a little heavy traffic, aren't afraid of a little weather, etc. -My Greek fisherman's cap is off to you. -At the same time, I find myself occupying a world wherein modern cars have been rendered so darned safe, the next generation of drivers will be incapable of parallel parking, or to be relied upon to apply the brake under emergency circumstances, or even to remain more or less centered in their lane. -Somewhere in between must be a happy medium. Those of us who insist on driving Brass-Era designs in modern traffic know full well that such activity is significantly more hazardous than piloting a Chevy Equinox just about anywhere. -Motorcyclists, whose vehicles enjoy a protective layer of armor consisting of flesh & blood, are actually in a safer place than we because, when the situation becomes dicey, they can accelerate and maneuver out of danger like jackrabbits, or stop on a dime and give you nine cents change. -We, on the other hand, have brakes like the Titanic and perform those other dodges about as well. It used to be that in the summer months, I'd nip down to McDonald's or wherever else I'd chow down on a daily basis, but then came to the realization that such reiterative use on Jericho Turnpike, alongside trucks, busses and hat-backwards maniacs, amounted to playing the odds perhaps a little too much. -The slowly traveled residential back-roads of my neighborhood made for far safer and enjoyable motoring environs for the pilot of a languorous horseless carriage. For purposes of keeping my epidermis intact and my bones on the inside, it occurs that a trailer is the way to go when considerable distances are involved. -From the kind responses given my question, here, I've learned that I'll need my own straps (preferably the type of webbing that holds each individual wheel down) and that I can rent both a trailer and tow-vehicle from U-haul, which means I don't have to live the rest of the time with an 8-mile-per-gallon car or deal with the storage headaches associated with a seldom-used, space-consuming trailer. - Thanks, Gang. I hauled a company demo that blew the engine in the back of a U-Haul truck in 1984. Mt Pleasants, Texas in the middle of an ice storm, wife and 2 small kids with me. NO ramps. The kid that rented it to me said if he KNEW I was putting a car in the back he couldn't rent it to me. However if I could get the car a couple of blocks downtown to the feed store I could back the truck down into a dug ramp and then run the car into the back. (and he would'nt know a thing!) I put 6 qts of oil into the car, got it downtown. (blown piston) At the feed store ''ramp''there was a foot to 18'' gap to the truck floor. Out of desperation I finally took the plunge and ''jumped the gap'' slamming the brakes and barely stopped before the end of the box. The ''ramp hole'' the truck was backed into had a couple of inches of ice in it but the truck came out of it and we were off. The U-Haul guy told me if I had a wreck or damaged the truck with a car in it there was no coverage and they would expect immediate payment for the truck. I got it as he was flipping his lights off to go home at 9:00 pm. A good guy, he really helped me out. I drove my �26 tudor 33 miles yesterday - half on State Hwy 21 and half on an IH 35 ACCESS road. It was as white nuckle as I feared. Wife followed me in modern iron with emergency blinkers on and I placed a slow moving vehicle triangle on the T�s spare wheel. Pulled over a couple of times to let 20 or so cars pass. I am becoming more and more restrictive on the roads I drive the T due to hugely increased irresponsible traffic. Looking forward to participating w/ the SA Model T club tour around Victoria TX in 2 weeks. Any Forum Friends here then, come with us !! Yes, it's getting worse. I recently had a conversation with some folks from the Horseless Carriage Club and they told stories about how the old blue laws caused traffic to be so light on Sundays that they could caravan their Brass-Ear cars up and down the length of the Long Island Expressway in relative safety. -What a pleasure it must have been to have a ribbon of highway ahead with no intersections, stop signs or traffic lights! -Imagine being able to drive the cars as far as you darned well pleased�just leave it in high gear and chug onward. -I bet the cars loved it too. So I have this big AACA-sanctioned car show to attend at Old Westbury Gardens and it looks to be just barely out of reach by back-roads, but if we could use the highway, we could be there in forty-five minutes. -I'll try to rent a trailer and tow-vehicle combo, but something tells me there will be a big demand for them that weekend and I may not be able to get one. Many of us have the same issue in getting to events - tours and shows. In many cases it is hard to get to them without using main roads and freeways. I have a Chevy Silverado Z71 PU and wish I had a trailer but there are other things I need to spend money on so I am limited to local stuff. I looked at renting a U-Haul car carrier and it runs about $55 for 24 hours. It looks like a good alternative. Bob, just out of sheer vulgar curiosity, I Googled your street address. I presume that, to get out to eastern Long Island, you'd eventually have to take Rte. 25 to the north fork or Rte. 27 to the south fork. How far east would you have to go before getting on either of those roads, before they became reasonably pleasant drives and not crazy crowded? If you could find benign roads to get from your home to that point, you could do it without a trailer and without a heart attack. If you haven't seen the aux wheel tow set,up that Tom and the Spokane guys use to get their cars to the M 500 every year you should check it out. From where I live, in Commack, to the split off of the north and south forks is about a forty-five minute drive on the Long Island Expressway (Route 495) in a modern car. -From the there, heading further east, the roads have either one or two lanes in each direction. -On those roads, in some areas, there is either very heavy traffic (especially during tourist season) or speed limits high enough to make things hazardous for a Brass-Era car. -Nevertheless, there are also scenic areas of farmland with back-roads where a horseless carriage might feel at home. -The trick, of course, is to get far enough east without resorting to the highway. Route 25 is Jericho Turnpike, a multi-lane boulevard with a good deal of truck traffic. -Its speed limit in some spots would be a little too much for a brass car (I like to keep it at about 30-35 mph). -Jericho Turnpike is the island's longest business district road and it has a lot of traffic lights, which are a great, big pain in the neck because without the ability to accelerate sharply or brake hard, short-duration yellow lights can make things feel a little too sporting for a horseless carriage pilot, over a long haul. The residents of the towns out east on the two prongs of the fork have resisted, vehemently, any proposals to lay in larger or additional roads because they feel there is already too much tourist traffic. -That may be profitable for the business people, but the more numerous, tax-paying home-owners hate the idea. On the south fork, you have "The Hamptons," populated by a good many of the rich and famous, and they prefer things remain relatively quiet and secluded. -They feel that a lack of road access goes a long way toward protecting their privacy, and they really do hate "lookie-Lou's." -Those residents who are particularly affluent commute to the city by helicopter and avoid the roads altogether. While the north fork isn't quite as ritzy or trendy as the south fork, there's still plenty of recreational traffic (and hundreds of vineyard wineries to visit and tour). -The towns are in the old, New England style and mostly very quaint. -Still, a lot of the single and two-lane roads there have some pretty high speed limits and, during tourist season, quite a lot of traffic... and, unfortunately no shortage of impatient, aggressive drivers. -You sure wouldn't want to be leading a slow-moving, horn-honking parade of those guys! The Long Island Expressway does have a service road, but like most service roads, it is interrupted in places and one need do a little back-road navigating to get back on. -It's a time-consuming, tiring way to go. -You really do have to be on your toes and on red-alert the whole time you're mixing it up with that kind of modern traffic. -Oh, it can be done, but the experience is anything but relaxing. -Towing a trailer at 55 mph on the highway sounds like it would be easier, but until I try it, I won't know for sure. In the end, I suppose Long Island is a bit of a mixed bag when it comes to horseless carriage operations. -I do love living here, though. -We have hundreds of miles of beaches, hiking trails, museums, scenic areas, restaurants, shopping and all kinds of really cool stuff like that. -I live close enough to Crab Meadow Beach, near Northport, that I can drive the Model T to a nice, on-the-beach Italian restaurant. -It's one of my favorite destinations. I have a Volvo station wagon and a light ( 800LB ) steel double axle open trailer. The trailer cost about 3K to build new. I can move the T or other small car with no sweat. the limit with the T is the speed at which the windscreen can go - 55mph? I can sit inside the Volvo and listen to NPR .. with the AC on. Etc. 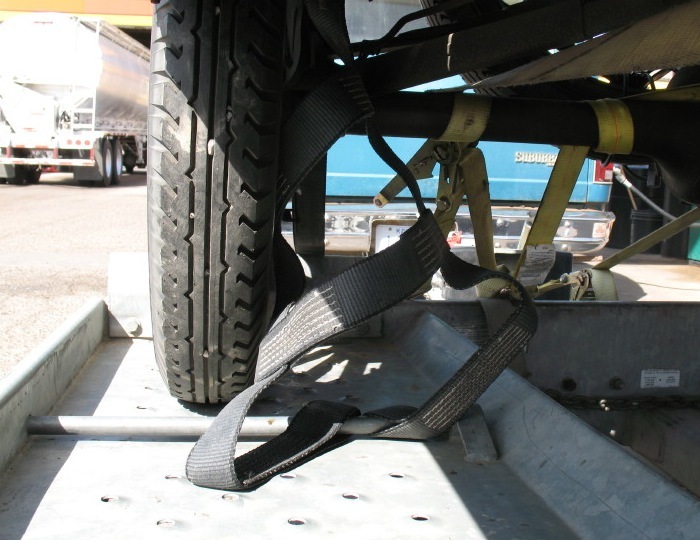 In my experience, that "basket type" of tie-down can be very difficult to use on a trailer that does not have tie-down points (such as D-rings) in exactly the precise locations where you need them. The tie down locations should be in a direct line with the wheel both front and rear, because a pull to either side does not work well at all. In other words, the ideal situation for this "basket type" webbing for each wheel only works well when used in conjunction with E-track located about 56" apart to match Model T Ford tread width. It occurs to me a discussion of proper methods for securing a Model T on a trailer deck could be worthwhile here. Given the concerns that have been posted to these boards about towing from the front axle (might pull the "wishbone" out of its socket)and jacking up the rear axle (don't split your pumpkin) perhaps there's more than meets the eye to giving your Lizzie a piggyback ride ? I kinda sorta agree with Harold. My trailer has airline track 56" apart, and I use use wheel webs. When I load a car, I try to have the wheels right on the track. But one of my cars is a wide-track 1912 Buick. I try to load it with the wheels straddling the track by somewhat the same amounts on each side. The resultant sideways pull from the wheel webs is negligible, and balanced. The problem comes if the car is mounted significantly left or right of center. Then the straps will try to pull it to one side, and, as they succeed, they will loosen. I find wheel webs have two big advantages. First, if one strap is loose, the other three will hold the car, unlike systems where straps around the axles are criss-crossed and pull to and fro. Second, I have a trailer long enough to haul two cars if they aren't too big. Wheel webs keep me from having to perform ungraceful contortions between the cars; I just stand aside and pull straight down, and my straps stay out of the oily middle of the trailer. For confirmation of Harold's comment on wheel baskets, see the picture I posted on March 5. That shows the one on the right side of the trailer. Here's the left one. Both fell of in a few miles. 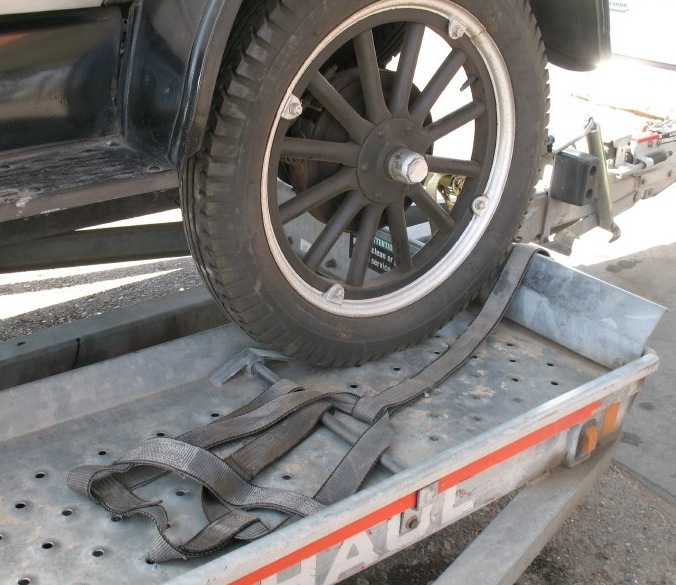 You can secure the U-Haul "basket" straps to your wheels using ropes or small ratchet straps. Otherwise, they do tend to slip off. I actually don't use my enclosed trailer much - at present it isn't even registered - but it is useful for other things. At present our lawn tractor, roto tiller, and push type lawnmower live in it when it isn't being used. It has locks on the doors, is chained to a large tree, and has a trailer lock on it. I'm aware that padlocks are designed to keep honest people honest, but as the trailer is now, an unwelcome visitor has to commit a felony to get either the trailer or it's contents. I used a U-Haul Auto Transport to get this TT truck home from 45 miles away. All went well. I've hauled my T with a U-Haul twice...no problems at all. The wheel straps worked great, the fold-down fenders are brilliant, the natural car position is perfect, the emergency brake setup is great, etc. Apart from a nice enclosed trailer, I consider them to be the best car trailers available. I'd love to have one, but U-Haul just won't sell them. Heck, I've even thought about buying one, taking meticulous measurements and having a friend (who's a professional welder) make one for me. Actually, U-haul sold off their old car haulers -- so if you really want want you should be able to find one. I think they are heavier than the current ones -- but all of that is from using them last century. I did a quick google search and there is a 1996 on forsale at: https://www.uhaul.com/TruckSales/equipment/831039/AT0682G/ from a u-haul dealer. $2,095 and it is the older model. A lot heavier duty than needed for a T, but can tow a lot of heavier cars if you want to and if your tow vehicle is rated for the weight. I don't recall seeing the newer style for sale. And the posting at: https://www.quora.com/Who-makes-the-car-trailers-for-U-Haul-and-can-they-be-purc hased-new Says you cannot purchase them but as you read the entire thing, at the bottom they say "once in a blue moon" a dealer will have a trailer for sale. And it appears that at: https://www.uhaul.com/TruckSales/used-box-truck-van-pickup-sales/AT/800/ they may list them occasionally. Thanks Hap...I'll look into that. 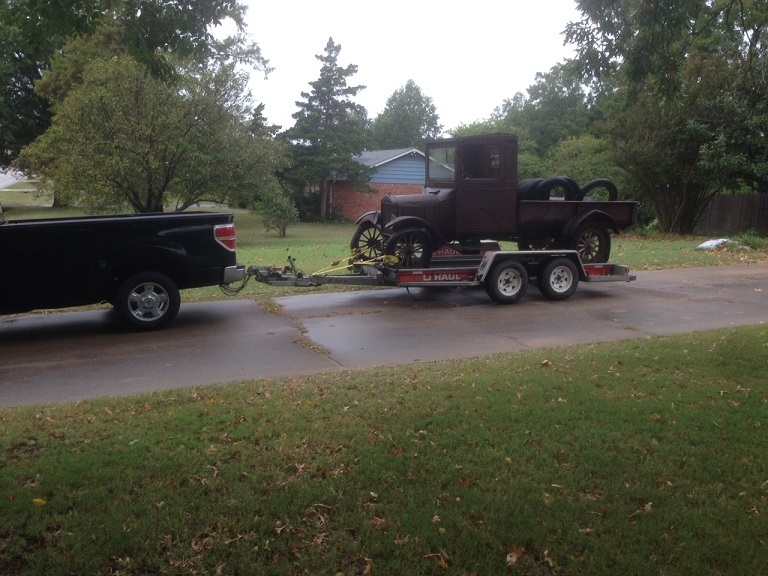 I've hauled more antique cars than I can remember on U-Haul trailers and have thoroughly enjoyed them. Some have been light cars like Model A's and T's and some really big beasts like 1950's era Cadillacs.